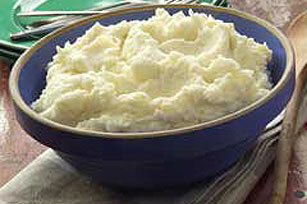 Here's a great twist on plain ol' mashed potatoes. Whip with parsnips and sour cream for extra flavor. Place potatoes, parsnips and 1 tsp. of the salt in large saucepan. Add enough water to cover ingredients; cover pan. Bring to boil on high heat. Uncover; reduce heat to medium. Simmer 15 minutes or until potatoes are tender. Drain potatoes and parsnips; return to saucepan. Add sour cream and butter. Mash lightly, leaving some of the potato and parsnip pieces in chunks. Season with pepper and remaining 3/4 tsp. salt. Substitute rutabaga or turnips for the parsnips. The addition of parsnips and sour cream makes these extra creamy and flavorful!